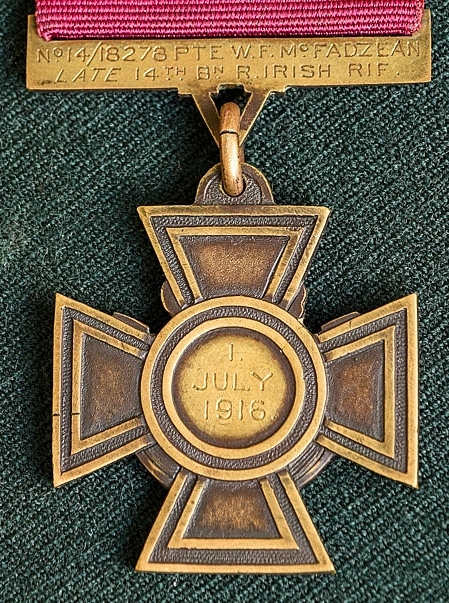 Battle Honour 'SOMME 1916, 18'. 109 Brigade Objective, Schwaben Redoubt. Private William F McFadzean standing on the steps of his family home 'Rubicon' in the Cregagh area of Belfast. William McFadzean was born in Lurgan, Co Armagh on 9 October 1895, the son of William and Annie McFadzean. His father came from Dundalk, Co Louth and his mother from Co Down. By 1901, William F McFadzean was living with his parents and siblings first in Jocelyn Gardens, Ormeau, before moving to the Cregagh part of Belfast. His father was a linen yarn salesman and had no doubt moved to Belfast to get work. All the family attended the Newtownbreda Presbyterian church in Belfast. The young William McFadzean went to Mountpottinger School until 1908 and became an apprentice at Spence Bryson & Co Ltd, Great Victoria St, Belfast. A well-built and tall young man, he played junior rugby for the Collegians RFC. His physique marked him out as a bomber when he enlisted into the 14th Battalion The Royal Irish Rifles on 22 September 1914. On 1 July 1916, he and his bombing team were getting ready for the attack in the assembly trenches close to the Front Line in Thiepval Wood. Grenades were being distributed amongst the men when a box of grenades being passed to Private McFadzean fell into the trench causing some grenades to become separated from their safety pins before falling into the crowded assembly trench. Without a thought for himself, Private McFadzean threw himself on top of the bombs. The bombs exploded, blowing him to pieces and slightly wounding two other soldiers. Without doubt, he saved the lives of all the soldiers in the vicinity. Private William McFadzean is commemorated on the Memorial to the Missing of the Somme at Thiepval. No. 14/18278 Pte. William Frederick McFadzean, late R. Ir. Rif. For most conspicuous bravery. While in a concentration trench and opening a box of bombs for distribution prior to an attack, the box slipped down into the trench, which was crowded with men, and two of the safety pins fell out. Private McFadzean, instantly realising the danger to his comrades, with heroic courage threw himself on the top of the bombs. The bombs exploded blowing him to pieces, but only one other man was injured. He well knew his danger, being himself a bomber, but without a moment's hesitation he gave his life for his comrades. 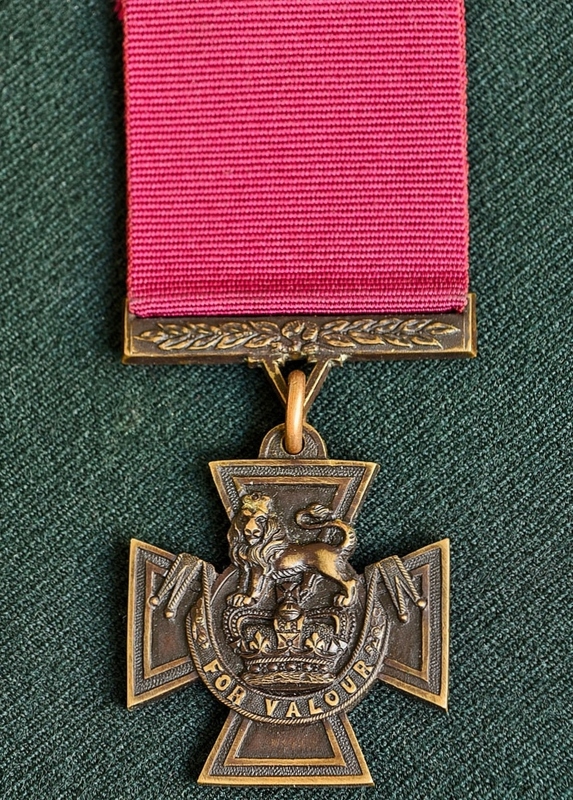 Private William McFadzean's father (also named William) was presented with his son's VC by King George V at a ceremony held in Buckingham Palace on Saturday 28 February 1917.